These are very warm dog coats as well as being beautiful. Whatever winter throws at you - cold, snow, wind, or rain - these heavy-weight coats will keep your dog safe and warm! Prices are depending on the size. 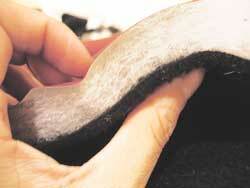 All coats are custom made, so they are perfect for all breeds, including those funny-shaped sighthounds! "Dear Sharon, I don't think I can easily put into words here, how pleased we are with the coats...Instantly attractive, superb quality professional (better than any bulk manufactured garment could be) work...All fit him perfectly and the colours, trim, tummy warmers and fleece are simply perfect. He looks fantastic and seemed quite calm and contented standing beside us. Yes, he did give them a thorough sniffing too.. "
See photos of our dog coats in action protecting dogs all over the world from snow, wind, rain, and cold! The FILLING is a 8.5 oz. quilt batting. This is a layer you won't see in other coats, and it makes a big difference on those windchill-factor days! The INSIDE FLEECE is manufactured by the mill that makes PolarTec™ - thick, warm, and 4 times more wind resistant than standard polar fleece. 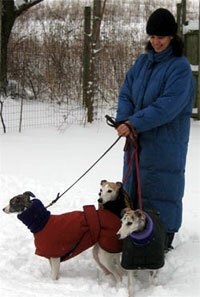 Together these 3 layers keep the dogs toasty warm even in the worst winter weather. And you can be sure of a good fit with our made-to-order sizes! If you anticipate prolonged exposure to heavy rain, we recommend the added seam sealer for $20. 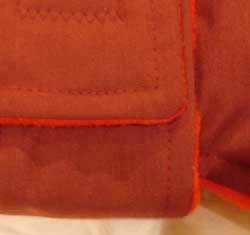 We also offer extra protection inner fleece for special needs dogs. > Let's Make a Coat! 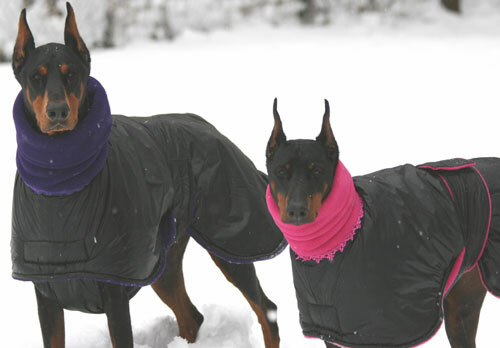 Dobermans Jazz and Zarra are enjoying their warm dog coats in 10 inches of snow and slush.